Fog machines are in use as anti-aircraft defences in Aleppo/Idlib and they put out a good volume - though so do main battle-tanks making smoke. 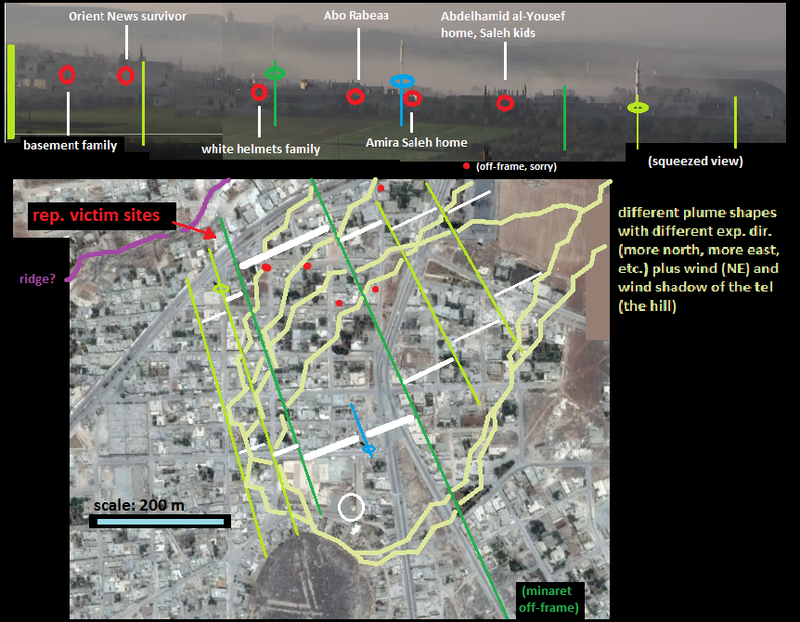 But thinking of screening and noise, I remember white phosphorous also produces thick white smoke thy use for screening. I don't suppose that's a good candidate for this situation, but it's another a reminder of how many possible ways there would be to fake up a scene like this. A street scene would surely have been their choice had they gone down the smoke machine fakery route: I can just imagine a hazmat wearing White Helmet carrying a child out from a white smoke cloud. The pictures made would have been instantly declared 'iconic'.. But, that would require putting some of their victims into some home-like place in the affected area first, and then going there to rescue them. It would have been a good idea, and not that hard to set up, but it seems they didn't go that route. Or they did, but the noise and billowing from the fog machine came through too clearly, and all such videos were considered ruined and never released. Who knows? Thanks for the bakery tip - seems we all agree, ad I'll probably keep using bakery crater as shorthand. Thanks. I didn't figure out how to find it yet (tried with coordinates, but nothing came up). Does seem worth a check though. Will try again. tweet, point 1): The same exact scene and very close time of year and day, just a little time gap and no differences except smoke plumes may have drifted off, and may even be seen drifting off, and fog covering everything, after an expanding cloud was seen maybe starting the process ... does not mean we should expect these are different days. Sorry. That's one route to take, that you admit seems "easy." I'm rigorous, not prone to take the easy way unless it really seems to also be the wise way. This call doesn't seem wise. Some guy is a presumed liar, and wrong-day video is a type of lie. Sure. But liars can use partial truth for their cases as well. He claims it was filmed on Earth and guess what? I buy that part. I think you'd agree. He says April 4, and... well, nothing proves otherwise and it could be true. So, if you can't just laugh it off as an obvious lie, so what do you do? tweet, point 2): If attack claims were tailored to pre-existing video ... that would be interesting to know. But how do you know it? We don't. No proof. These plumes might even have been filmed just when he says. They could use pre-made videos, or they could have done just what I propose here. And I proposed it because nobody else really has, and it could be the real lead no one else has followed. So... shouldn't someone? Just in case? So Salloum either fits testimony to videos OR describes the scene. The bakery crater not included could mean different things as well. It's a basis for speculation like anything. 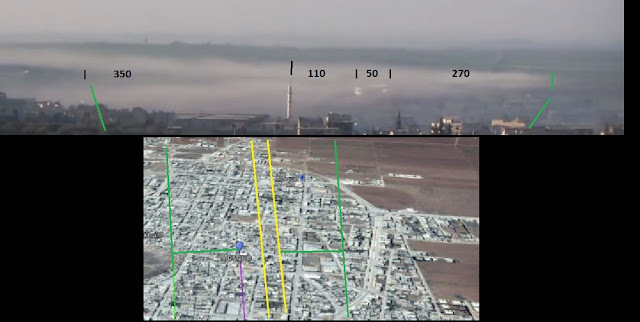 points 3) and 4): this needs planning and preparation - you don't just wait for Assad's jets to pass - you fake the right scene on the best day, use natural mist when it happens, and release it on the day of the lucky jet pass. OK, that does make sense. But how uncommon is a morning surveillance flight? It could be daily for all we know. You might also trigger a special flight by doing something shady the night before they'll want to go have a look at in the morning. And why wait around for an adequate mist video at the right time of year and day to match an attack video with jet noise from the same time of year and day, that will match the day and time of the unknown lucky jet pass? When you could just wait for the daily recon pass, provoke an unusual scan and use that, etc., and get your fog on cue, starting as jets can be heard departing, without waiting around for mother nature to do it for you? 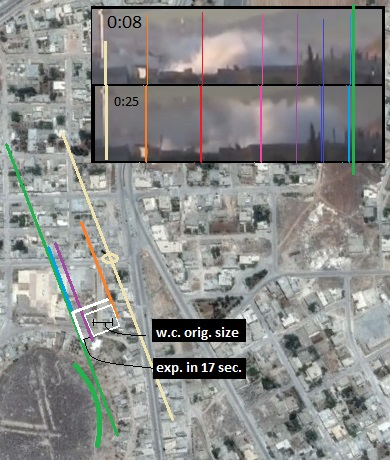 Qoppa feels false-flag scenario means "using pre-fabricated material" is "by far the more plausible assumption." Having studied these things for years and found some recycled/misattributed and wrong day videos, I disagree. It's one method to keep an eye out for. But sometimes, yes, they manage to fake things on the same day as their story. Just because there's a possible lie out there to tell doesn't mean they must be telling it. Videos of fake Assad crimes are: Never filmed in the future, sometimes filmed in the past, sometimes filmed in the present. And, a reason not to use wrong-day videos: it can be dis-proven that way, usually with ease and within days, and cause problems for their story. Note: that hasn't happened here. If they faked it, it was so well-done that it really could be all one day and that could even be April 4. More attempts at an elusive proof of wrong day: image montage to show 2-3 different events. 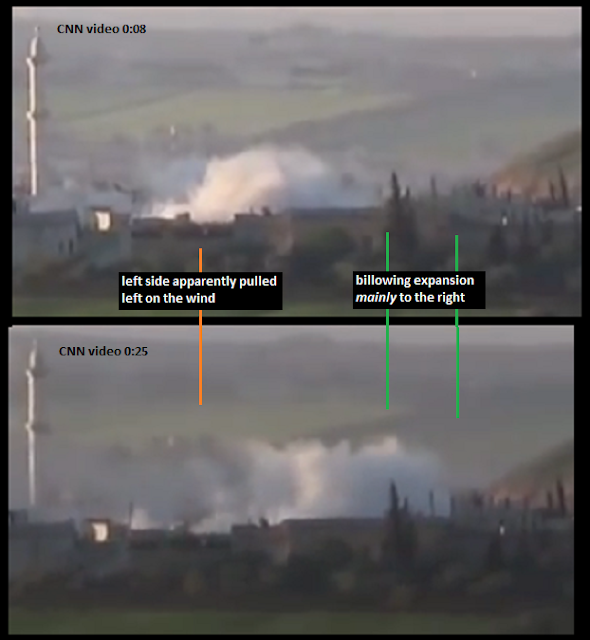 Based only on absence of smoke plumes, which drift away in probably 10 minutes or so, and a supposed difference in the kind or area of the fog in the two bottom views, and maybe the weird, drifting-away smoke plumes in one view... that actually seems to tie it all together. 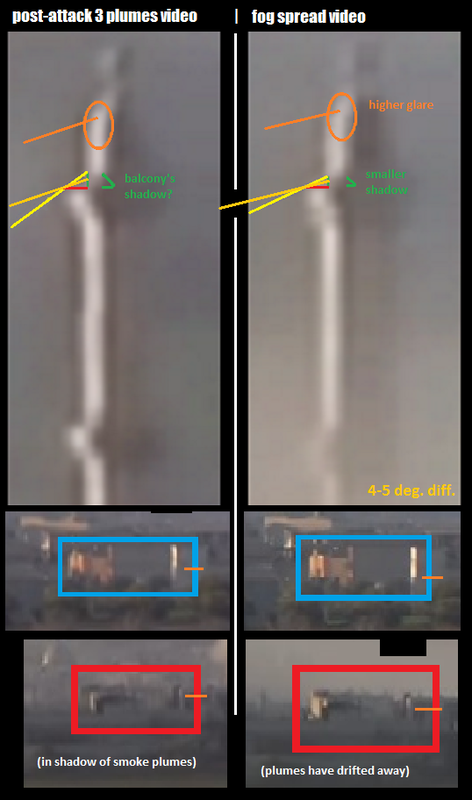 Here's my remix of the same images shows why all one day, if not all April 4, is still the best interpretation. The evidence is ... two morning videos claimed to be and quite possibly from Aril 4 ... IF SO, as I'm pursuing for good reason, they only have 20-25 minutes to fill that area. Just because I haven't seen any videos of people inside the fog doesn't prove anything (see post, response to Andrew above). ... I've already spent way too much time arguing this point, so I will have to be brief with yet another response that I'll call final. sorry but you haven't. You keep brushing away the far easier, simpler & hence better solution, in favour of your deus ex machina. It's easier, simpler and better to ignore this evidence as certainly irrelevant? Or as most likely irrelevant, because of some dubious logical construct? That does sound easier than what I'm doing. But I'm doing this for a good reason, easy or not. but suggests I should" give more weight to this alternative." Not that I should give so much weight as to not bother with the exercise of anlyzing them as if linked. But that's how it often seems, getting presented as the answer every time I find something interesting in this "deus ex machina" line of inquiry (like, hey, why waste your time and confuse people with obvious wrong day lie videos? And I'm like, how many times do I have to explain this?). I think I've weighted the option about right, but with the well-wasted time I put into this final answer, let's me say I've been more than fair and patient enough to have earned a "moving on with no hassles" pass. I will admit, as unsupported as it is and as unlikely as I find it, it's possible these videos are not all from the morning of April 4. And as long as it stays just possible, it's not one I'm going to let get in my way any longer. Because all the time I've now spent debating this subject and defending my course is time I could have spent making progress on that course. I sense that some people I'm debating are unemployed and enjoy lost of free time, but I do not. So, any further pestering by anyone who knows this (Qoppa999 anyway) I'll consider an attempt to just waste my time, and obstruct the progress of valuable work. And since I already was feeling like that, let's say now I do it with no apology and no looking back. Bring proof of wrong day if you get it. Do not bring me daily failed attempts. 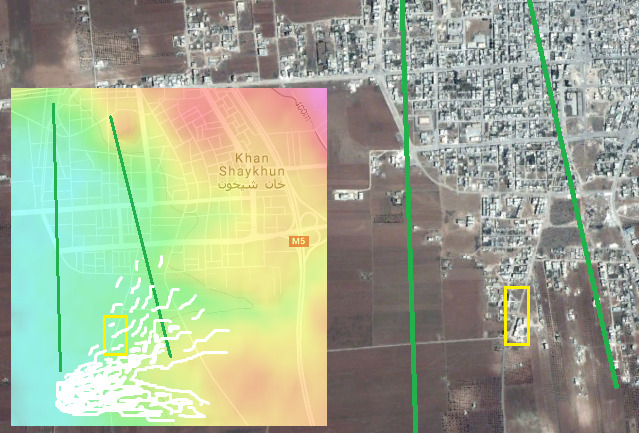 1/AQ has inside info when an air raid will take place (it is a civil war, plenty of spies around). This is around the 4th of April. AQ films it (2 POV's filming at exactly the same moment), and they are in luck, there is a morning mist which dissolves very quickly because of the bombing (some mist remnants can still be noticed in bombing video). Overview videos are prepared in headquarters (needs time, can't show too much that would give away fakery). 2/Maximum a few days later all is ready and the victims scenes are staged. 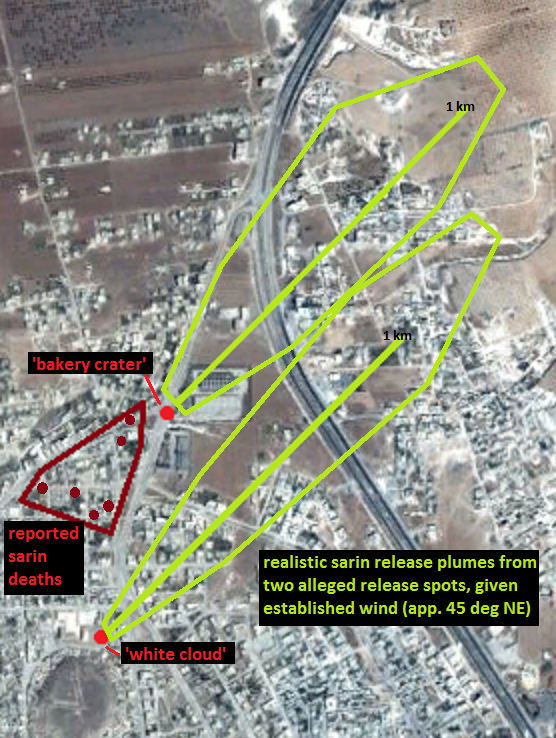 No Sarin used in the field of course, too difficult. Other lethal products will do for the kids and adults they want to get rid of. 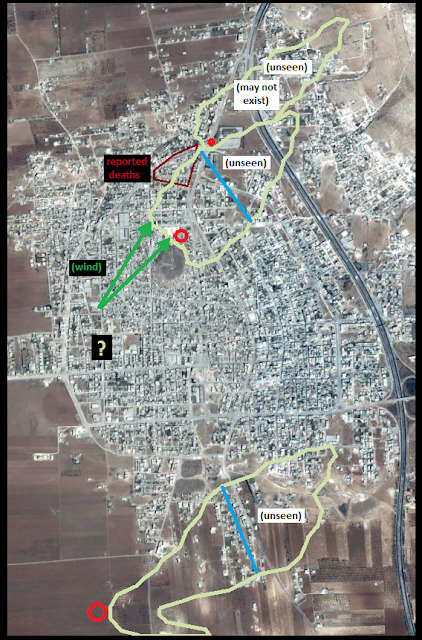 3/For the sampling by OPCW all are prepared. The dead victims were forced to drink DIMP (or something else that would give a Sarin metabolite) which resulted in Sarin or sarin-like markers in blood and urine. For the bird and soil, a lab in Trk could easily have contaminated them with a real Sarin sample (this in a controlled environment). 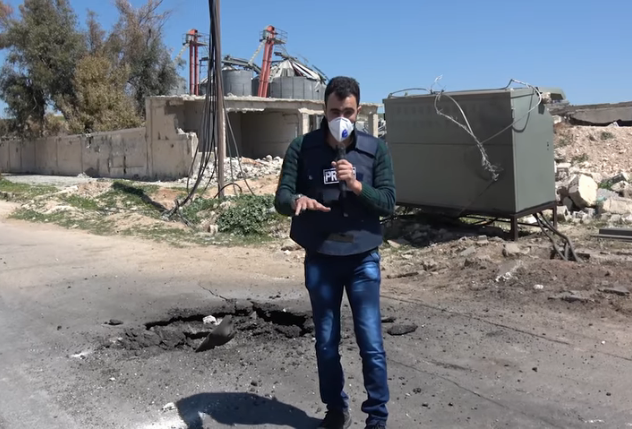 That explains the OPCW reporting which is again, just like in Ghouta, very vague in their reporting. Only problem they may have with filming over a number of days is it runs the risk of being caught out by satellite photos, something they really can't control. 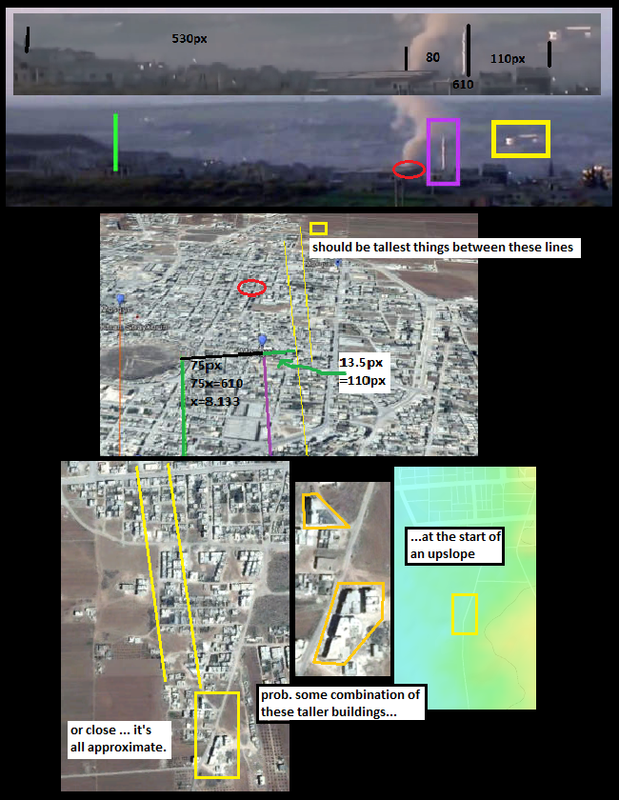 Same problem with Postol's latest, if the video is from earlier airstrikes then there is no way of knowing that satellite photos showing the related damage don't exist somewhere. Crater, airstrike damage and publishing victim videos would all really need to be on the same day. Wondering if Postol is letting all this become too much of a personal fight with Bellingcat. Can anyone see anything along the line Postol has drawn for his debris cloud #2? Or a new building maybe as it looks to be casting shadows on April 6? The plumes do all seem to match up with the NYT video. Orbi's theory: parts are plausible. 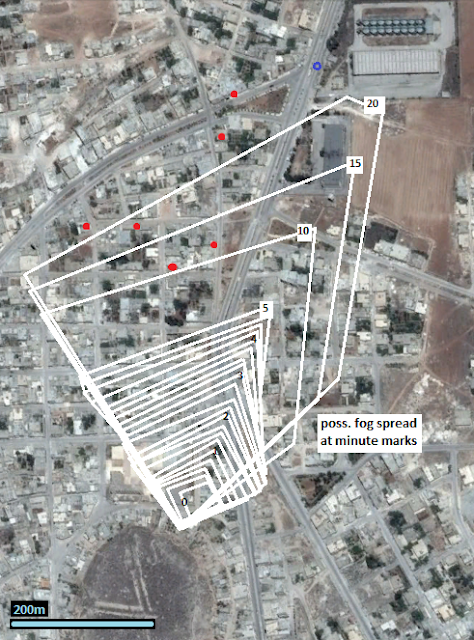 Little time but one note: the state of the art tests they SHOULD use are clear if its sarin or an imitation. 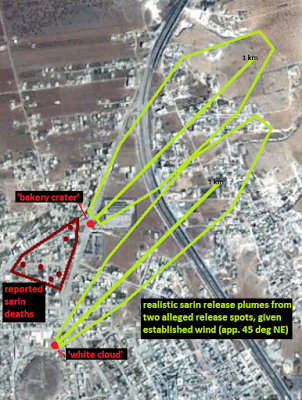 But since they say "or a sarin-like substance," it's suggested they used the old test. Why? Maybe because they used the new test first, and it showed not sarin, so they did it the other way to get a 'maybe' result. 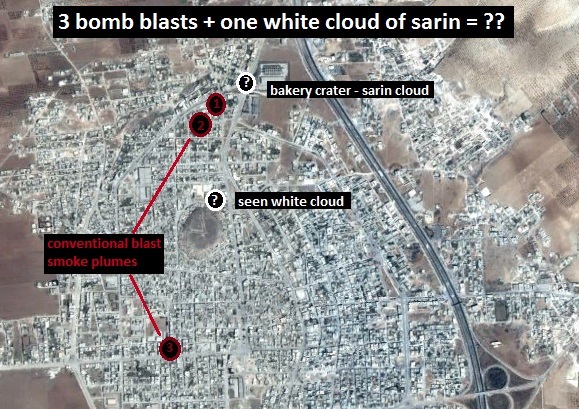 Why not sarin, if so? Did they run out? This is the one place you'd out it if you still had any. All in all I suspect it is sarin, but they do leave it open to doubt, so I also doubt it some. Postol - what a coincidence he proposes. One some non-April 4 day, there was some attack causing three plumes in certain spots - all of which were also damaged on some other day since Feb. 22, with something else smaller. I'm not buying that. The damage seems less than it should, but I don't think Postol or I can really say there's no reasonable match - something that causes that little damage but sends up that much smoke. My money would be on that option, even though it's undefined. His line of sight graphic (and maybe he'll learn how MS paint often shrinks your text block as soon as you're done...) Good call, Andrew. He set it up wrong. That's fine, if you DON'T go making serious claims based on it. Until there's a better space ... Postol. I'm getting ready to rant on him. Too many errors, something badly wrong. Fudging lines of sight and stuff. Possible reason: he knows his story is BS and tries to obscure that. He argue the damage is too small for the big blasts seen on video. Those, he says, happened, before but not on April 4, and the spots hit would be totally flattened. Problem is, in at least 2 cases clearly, the spots are clearly KNOWN, not lost on a fudged line of sight like he pretends. And even after this pre-April 4 block-flattening attack he's so certain of, there's still one flattened wing, a broken wall, a hole in the roof, and whatever unseen damage inside. Oops! BTW I have tried to alert him of his errors by e-mail, as have others I know. Zero response or heed. This is bad. Yes - I think it has become too much of a personal fight with Bellingcat and it has clouded Postol's judgement; just trying to show things are wrong without considering implications. I'm still not sure how much the bombing video matters when it doesn't show anything relating to the alleged chemical attack. It could be fake, a different day.. some activist sold a gullible journalist some videos from another date... but then so what? I think if the claim is that a bomb dropped from a plane was in that crater dispersing sarin then for me it all comes down to "where is the bomb?" No bomb = no chemical weapons airstrike. If genuine, no-one would hide it, no-one would lose such important evidence. The only reason I can see for it being removed is to prevent anyone seeing that it was not something dropped from a plane - or there was never any bomb to remove. 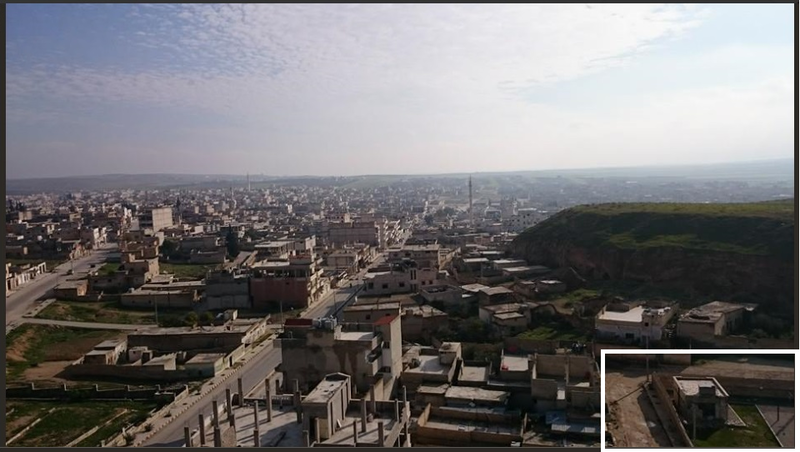 Maybe a filler cap from the bombs used to destroy the silos 'found' its way into the crater.. must be a bunch of bomb fragments in that rubble.